Only £250/$440 AU for a whole weekend's sailing. Much cheaper than most sailing schools. As a non-profit Sailing Club our in-house, cost price courses are already much cheaper than most sailing schools. Your live-aboard weekend with 18 hours sail training, all your food and a bed overnight is only £250/$440 AU. Where else can you get value like that? Whatever your level of expertise, there's a schedule of progressive courses to keep you learning. Because all our weekend live-aboard courses are £250/$440 AU, you just pay as you go. So if you wanted to spread your Competent Crew weekends over a whole year, that's fine. Book each module as you're ready, the money stays in your bank account, not ours, till you're ready to come on the course. Peter Edington is an RYA Yachtmaster Instructor who has skippered the club's yacht across 3 Atlantic crossings, 1 Trans-Pacific, 6 Tasman Crossings, 4 Coral Sea crossings and to the Bass Strait. He is also an MCA 200 ton commercial skipper, a Remote Area first-aider, a Certificate IV Trainer and a NSW Coxswain with certification for Sea-survival and STCW95. And by the way he sailed this yacht from England to Sydney with his wife and two of his teenage daughters. So he's pretty good at helping people go sailing. Your weekend will never be wasted. Because our vessel is a fully equipped ocean-going yacht, we have lots of choices if the weather changes (no drifting under a baking sun for us!) Our 70 HP motor will take you to an anchorage where you can have lunch or tea then switch to some essential theory - there's VHF radio, radar, ropework, charts, the opportunities are endless. And if there's too little wind, there's the inflatable dinghy to learn to drive, the rigging aloft to inspect (er.. that bit's voluntary). Or maybe try a swim - to enhance your understanding of the boat's underwater geometry, of course - and then there's more tea, coffee, cordial, cake. And if life catches you out and you just can't do the weekend you'd planned to do, we will usually be able to offer you a future date, mutually agreed, when you can try again. Live aboard for one weekend. This includes about 18 hours of sail training and some night time sailing. To join the Competent Crew Course, you must either have completed the Start yachting course or have a similar level of sailing experience. Then if want to consolidate your knowledge so far, come on our Competent Crew course. Split over a two 2-day weekends (£500/$880 AU) or occasionally a 3-day weekend (£375/$660 AU), living aboard. This will include over 35 hours of sail training including about 8 hours night sailing and coastal sailing. As a course, new to The Ocean Sailing Club, we are just finalising details. The Watch Leader Course is a 5 day course conducted on board a yacht over 15m LOA to teach watch keeping, seamanship and navigation up to the standards required for taking charge of a watch on deck, at sea or in harbour, under supervision of a deck officer. The Watch Leader Course can be conducted in tidal or non-tidal waters. Because we are all sailors here at The Ocean Sailing Club, we understand that it's hard to get enough days off to cover the required 40 hours of face to face training for this valuable qualification. So, our Yachtmaster Theory Course runs as 10 stand-alone modules - usually on alternate Saturday and Sunday mornings - from 0800 to 1200 so as not to interfere with your race sailing schedule. It provides the theoretical knowledge you will need to safely skipper a yacht anywhere in the world. Because the Club has arranged these lessons to be taught on a rolling basis, and each module is self-contained - with its appropriate RYA exercises/assessments, yu don't absolutely have to attend them in the order they are run. So you might miss Module One, being on holiday, so start at Module Two a fortnight later; take all the and then take Module One next time it is run, few months later, before sitting your final RYA Assessment. New to The Ocean Sailing Club The format of this course is still being finalised. Worldwide Meteorology - Including tropical revolving storms (hurricanes etc), Indian Ocean monsoons, ocean currents and gyres. The course is a 2-week, 1,000 mile, live-aboard Coral Sea crossing. To pass the interview-based RYA Yachtmaster exam you will need to be an RYA Yachtmaster Offshore with excellent organisational skills and a wealth of practical experience sailing unsupported across substantial bodies of water. This voyage will help you master the skills required to sit the interview-style exam for RYA Yachtmaster Ocean. You will take from the voyage a a portfolio of logs, reports and chart plots needed to sit that exam. And here's a glimpse of the Club yacht beating to windward in a full gale. We would only do this with more advanced student members but it's good to see how safe and dry she is even under these conditions! It's nice to have experienced some heavy weather sailing under the watchful eye of your Offshore Yachtmaster before you try it on your own! 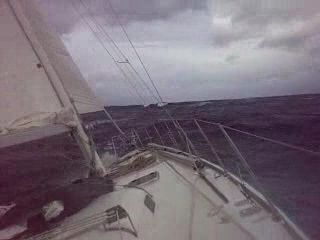 Here we are pushing uphill in 35 knots against a lumpy sea. But, after you've seen and felt what it's like, you'll be better equipped to try it on your own. Thanks to Mylo for risking his phone to capture this. It is definitely a moment of hand-held movie footage so hang on! The noise is the wind.